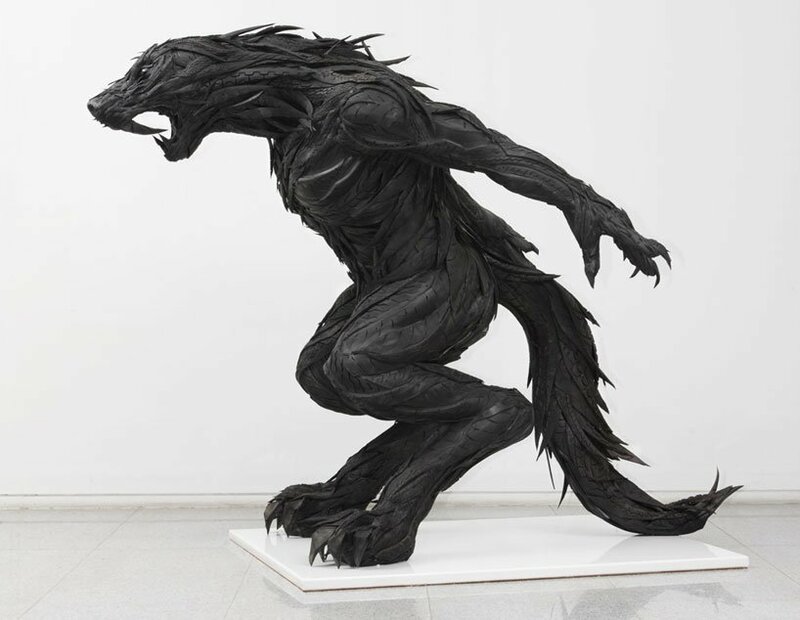 korean artist yong ho ji has expanded his ‘mutant mythos’ series, continuing to create sculptures with layers of used tire strips bound together by synthetic resins on supporting frames of steel, wood, or styrofoam. examining genetically modified organisms and darwin’s evolutionary theory, this body of work depicts eight stages of transformation in the tradition of classical sculpture: carnivorous, herbivorous and omnivorous animals, anthropods, fish, hybrid animals, hybrid humans, and finally humans. having grown up at the base of a large mountain in korea, ji adopted tires as his signature material based on a childhood memory of the spare wheel on his family’s jeep, vital in the rural landscape where his grandmother raised cattle and other livestock. this early exposure to both domesticated and wild animals informed his desire to make art about humanity’s responsibility to nature, via subject matter as well as recycled materials. Beauiful! I love the zebra! Beautiful! The shark is outstanding! it’s beautiful……….. i like it!!!! better than any 3D rendering. only you can do this. Un be fokken lievable! You go boy. Cool!!!!!! Not only the idea, but also the way of using the different tires for different body textures and effects. I love it.